Father’s Day is approaching and there’s a few Boston attractions and places that are celebrating Dad with FREE admission and freebies! 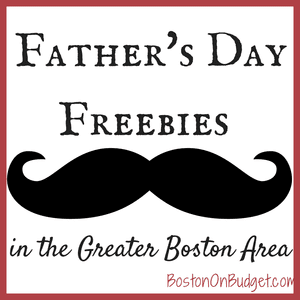 Here’s where Dad gets in free in the Greater Boston area for Sunday, June 21, 2015! Davis Farmland (Sterling, MA): Dads get in free on Father’s Day! The Pantry (Natick): Free 10oz steak for Dad on Father’s Day. Reservations required. LEGOLAND in Somerville is offering Dads $5 admission when you bring a child on Father’s Day if you are looking for low-cost fun to do on Sunday. The Red Sox are also hosting Walk In the Park where Dads (and families) get walk the warning track of Fenway Park and more for free. If I missed any great freebies and discounts, please let me know in the comments below!